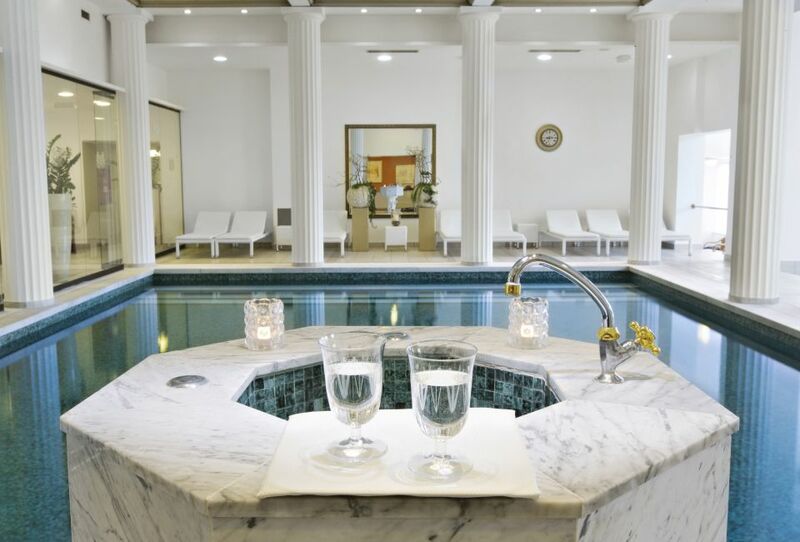 The Luisa Spa and its wellness programmes can be found in the Grand Hotel Toplice, which was built around a thermal spring that refills the swimming pools daily. Its distinguishing feature is an elegant swimming pool complex with a spring of thermal mineral water possessing healing properties. Take a look at the wellness packages with accommodation! The swimming pool is refilled with thermal water every morning and offers views of Lake Bled just a few metres away. This is true relaxation in paradise! There is a thermal spring in the Spa Studio. Swimming in the thermal water has a soothing effect on the cardiovascular system, while drinking thermal water helps relieve stomach problems. Wellness rituals for wellness enthusiasts are the pinnacle of the exclusive range of baths, massages, saunas and body and facial care. 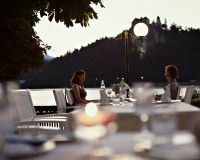 With its view of Lake Bled and its terrace, the Luisa Spa provides an intimate environment for small-scale parties and bachelorette parties, as well as programmes for couples. Entry to the thermal swimming pool complex is free for hotel guests. Treat yourself to a glass of thermal water directly from the spring. 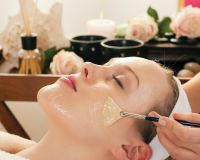 Wellness rituals include several exclusive wellness services that will make you truly radiant. Numerous luxuriant and classic massages, pearl and herbal baths as well as Finnish, Turkish and infrared saunas – all in the opulent intimacy of Spa L ...uisa. Inspired by the beautiful nature of Bled, the healing properties of local thermal water and the skin care expertise of Heaven cosmetics, the Grand Hot ...el Toplice has collaborated with Heaven cosmetics and used the best that nature has to offer in order to create something brand new and innovative for our guests. Making the most of their skin care expertise, Heaven has added the Luisa Spa thermal water and developed a collection of heavenly luxury treatments using thermal water and Heaven cosmetics – healing treatments that soothe the body, mind and spirit. The Heaven products are based on bee venom, a clear, odourless liquid that the bee releases when it uses its stinger. The use of bee venom stimulates blood circulation in the skin and boosts the production of collagen, which firms the skin, and elastin, which maintains skin elasticity. In the elegant environment of Spa Luisa, classic pedicures, manicures and depilation treatments, eyebrow shaping treatments and make-up sessions will ...be a truly special experience! The atmosphere at Spa Luisa is just perfect for small parties and celebrations. We prepare them in coordination with the chef of Grand Hotel Toplice. The water in the Luisa Spa thermal pool has a constant temperature of 22°C, as it is filled by thermal water from a natural source, straight from the spring. Fresh natural water flows uninterrupted into the pool, which is emptied on a nightly basis and refilled with fresh water. Swimming in natural spring water has a highly reinvigorating effect. Thanks to the many minerals it contains, bathing in our thermal water is said to have a beneficial effect, particularly on the heart and the vascular system. We recommend two pool visits a day: an energising swim in the morning and a relaxing swim in the evening before bed. You can also take a dip in thermal water after enjoying a sauna or a wellness treatment to maximise its effects. It is also possible to drink from the fresh natural thermal water spring at the Luisa Spa. Drinking thermal water has a number of positive effects on the body, mind and soul, as it improves well-being, transports nutrients around the body, helps to remove toxins, stimulates digestion and tissue formation, soothes the stomach and other internal organs, and helps prevent a number of health issues. For best results, we recommend drinking two glasses of thermal water a day. Where the Grand Hotel Toplice stands today, two hot springs with healing properties were discovered in 1818. Just four years later, Bled’s first spa opened. In 1854, Louisenbad (Louise’s Spa) was built here – the predecessor of today’s Grand Hotel Toplice. 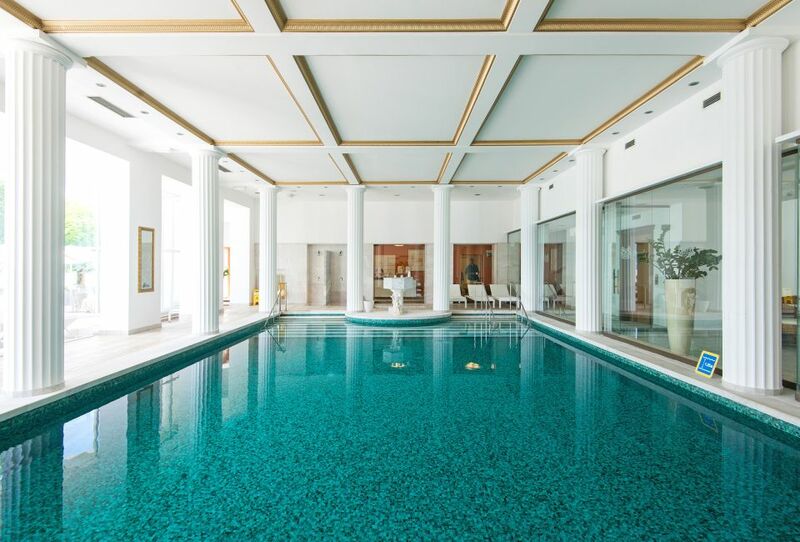 In 1932, a swimming pool in the style of an ancient Roman spa was built in the Grand Hotel Toplice, featuring 30 cabins for up to 90 swimmers. It was filled with thermal water from the spring beneath the hotel. The swimming pool was usually reserved for hotel guests in winter but would open to the general public in summer. 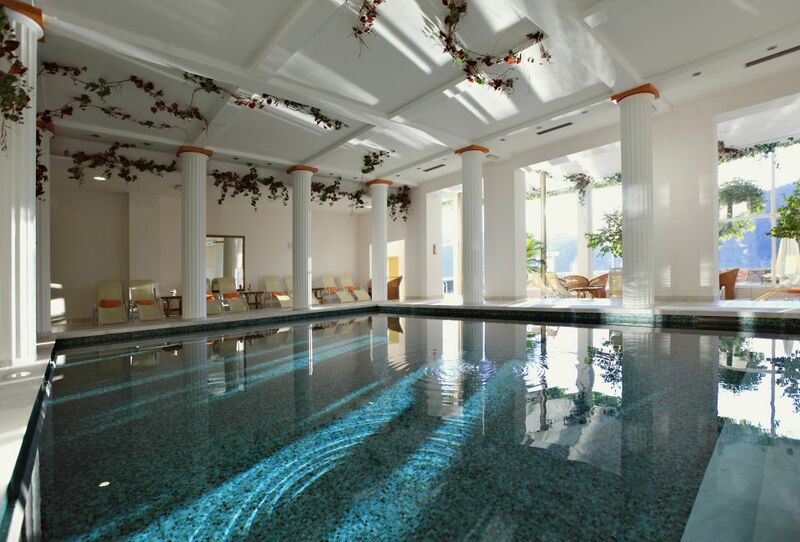 The original thermal water spring and elegant Roman-style pool have been preserved in the Luisa Spa.